OS X, similar to iOS, uses points to represent display coordinates. Traditional OS/display combinations had a 1:1 mapping between points and pixels. Points in OS X are now floating point values, as a single point can be represented by multiple pixels on a high density display. How pixels map to points is determined by the backing scale factor. The backing scale factor can either be set to 1.0 or 2.0. In the case of the former you get 1:1 point to pixel mapping, while in the latter each point is backed by four pixels. The backing scale factor isn’t a global value, it can be set on a per element basis, allowing controls to to be legible while you get the benefits of a higher resolution for additional screen real estate. This aspect of OS X is key to enabling good behavior in applications as you’ll soon see. Apple does a lot of the display handling for you so you don’t have to think about any of this. All vector based graphics and text using Apple’s APIs are automatically scaled up. Unmodified dialog boxes, toolbars, menus, etc.. should all look “normal” sized and just be ridiculously sharp on the Retina Display. 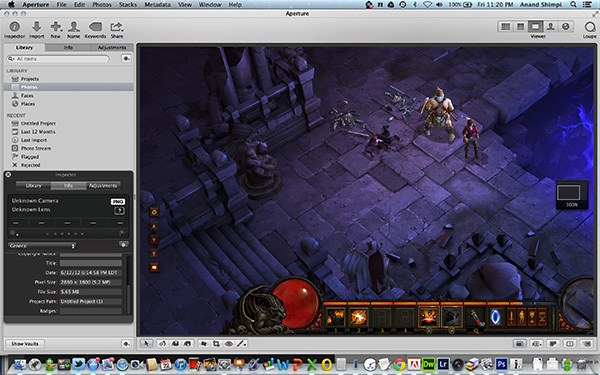 Bitmapped images are scaled up using linear interpolation, but if higher resolution assets are provided OS X can simply swap and use those on a Retina Display. Applications that render vector graphics, text and other elements to their own backing store will need hand tuning to look good on the Retina Display. These elements will receive the same linearly interpolated upscale I mentioned above. It’s a bit complicated and confusing so let me try my best to explain what’s going on here in a practical sense. The 15.4-inch Retina Display has a native resolution of 2880 x 1800, that’s 2880 pixels across and 1800 pixels down for a total area of 5,184,000 pixels. 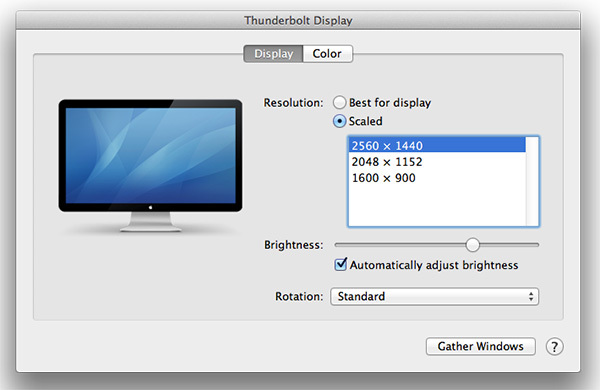 In the default “best for Retina Display” setting, the desktop, menu bar, icons and Finder windows are drawn at 2880 x 1800, but they are drawn larger than they would normally be at 2880. Apple draws everything at 4x the size to make the desktop behave exactly as it would on a 15.4-inch 1440 x 900 display - this is the backing scale factor (2.0) at work. This approach provides the best image quality as there’s integer mapping from pixels on the panel to pixels on the desktop. No interpolation or filtering is necessary. 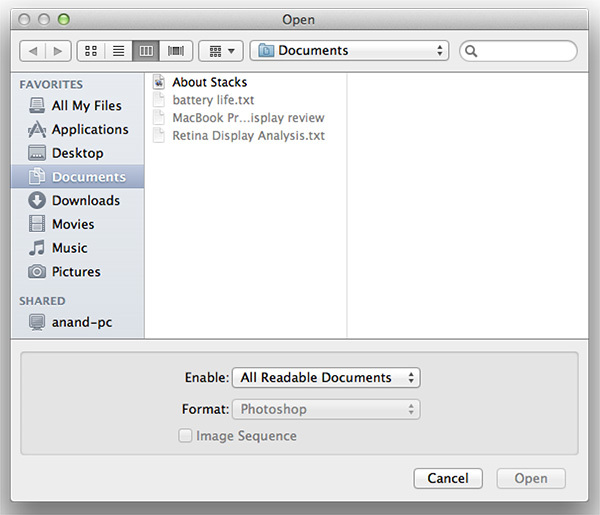 Third party applications without specific Retina Display support also operate in this same “looks like 1440 x 900” mode. If you fire up Chrome, Photoshop or Word you’ll see that everything looks identical to how it would look on a standard resolution 15-inch MacBook Pro. Again, the screen is drawn at 2880 x 1800 but everything is scaled up to be the same size it would be at 1440 x 900. It’s not just third party applications that need updating however, even Apple’s own iWork suite has yet to be updated to take advantage of the Retina Display. As a result text in Pages is incredibly blurry. 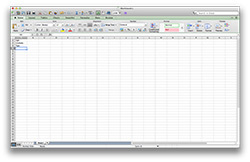 It has been roughly three years since Apple last updated the iWork suite, so the applications are definitely due for an overhaul. 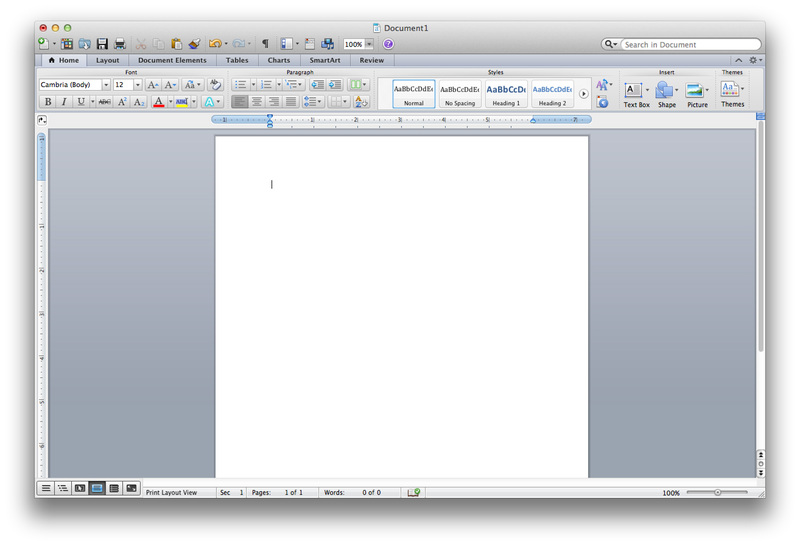 I am a bit surprised Apple didn’t update them at the launch of the rMBP to be honest. It’s quite possible that a major iWork update is imminent and Apple didn’t see the need to update 3 year old software in lieu of that. Eventually most apps will by default open in high resolution, such as those that have been optimized for Retina Display operation (e.g. iMovie above). Those applications that are not yet Retina aware may default to opening in low resolution mode (e.g. Adium, Pages), in which case they'll look and behave like they would at 1440 x 900 but with all UI elements upscaled to fit the 2880 x 1800 panel. Non-Cocoa applications will have the resolution scaling option greyed out (e.g. 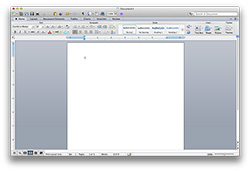 MS Office apps). Here Apple is scaling the UI elements like the menus and widgets on the screen (backing scale factor = 2.0), but displaying the open image unscaled (backing scale factor = 1.0). As a result we can fit almost an entire 2880 x 1800 image on the screen without zooming out. Remember the backing scale factor isn’t global, individual elements on the screen can be scaled independently depending on their purpose. The same thing happens when you look at applications like iMovie or Final Cut HD. 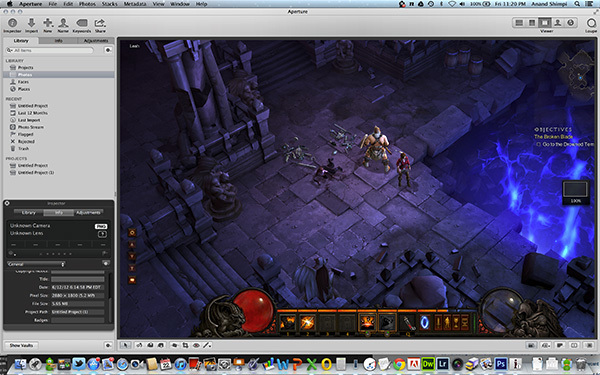 The UI elements are scaled up but the video window is displayed unscaled, thus allowing us to display a full 1080p video alongside text and tools that are still legible. It’s all handled amazingly well. It just works. 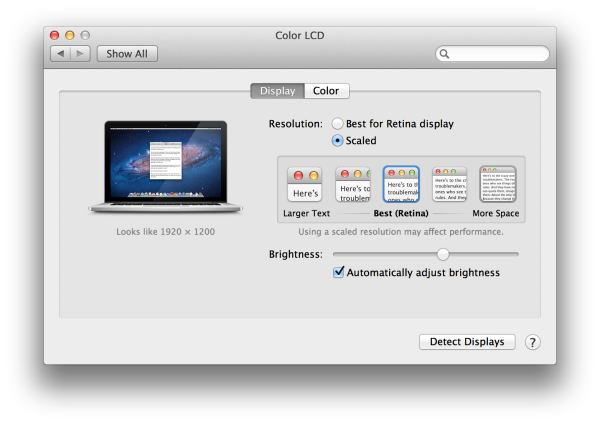 If you select the 1680 x 1050 or 1920 x 1200 scaling modes, Apple actually renders the desktop at 2x the selected resolution (3360 x 2100 or 3840 x 2400, respectively), scales up the text and UI elements accordingly so they aren’t super tiny (backing scale factor = 2.0), and downscales the final image to fit on the 2880 x 1800 panel. 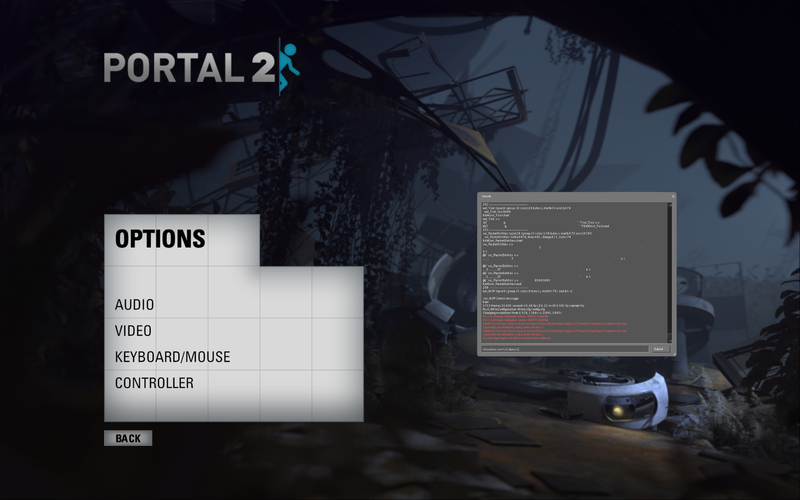 The end result is you get a 3360 x 2100 desktop, with text and UI elements the size they would be on a 1680 x 1050 desktop, all without sacrificing much sharpness/crispness thanks to the massive supersampling. The resulting image isn’t as perfect as it would be at the default setting because you have to perform a floating point filter down to 2880 x 1800, but it’s still incredibly good. 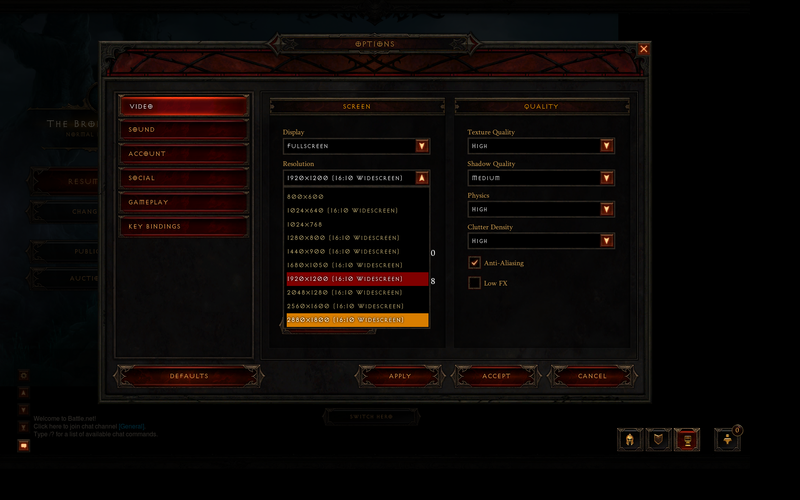 Note that we can fit the entire 2880 x 1800 image at 100% almost without having to scroll. This is possible because our screen is actually rendered at 3360 x 2100, with the text and UI elements scaled up so they aren’t super tiny, yet the image is left unscaled. The 2880 x 1800 image looks downright small since our desktop is rendered at 3840 x 2400. Despite the fact that we’re able to fit everything into a single screen, the text and other UI elements are totally usable at this setting. You get the benefits of additional application real estate without any of the downsides. What happens if you decide to take Aperture full screen? 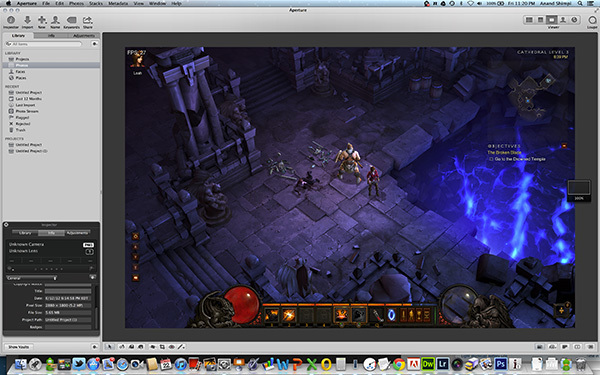 The image is displayed almost completely at 2880 x 1800. You do lose a little vertical real estate but not much at all. 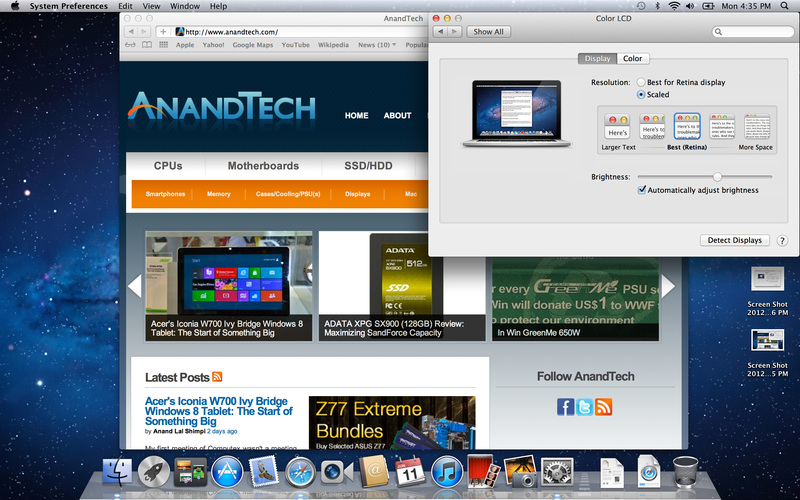 The flexibility offered by Apple’s handling of the Retina Display in OS X is unparalleled. What applications like Aperture, iPhoto, iMovie and Final Cut HD offer, is unbridled resolution independence. 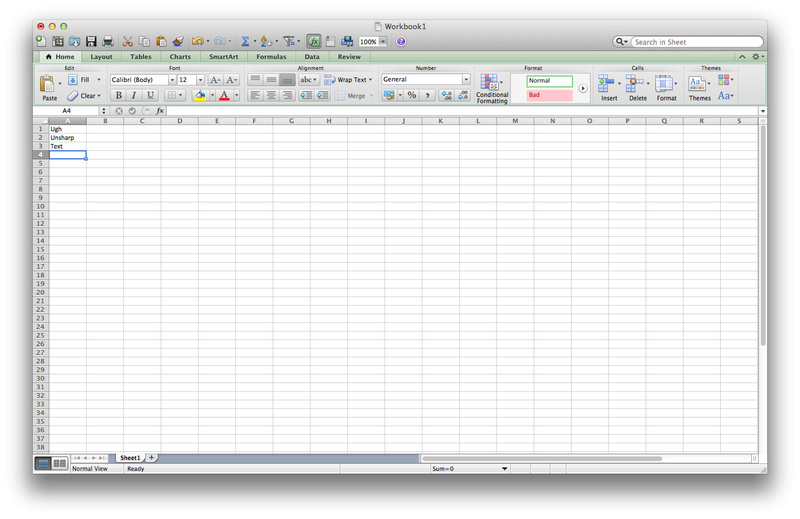 What Apple has done here is so much more difficult than what it pulled off in iOS with the Retina Display. It will take time for third party application developers to get on board, but with the power of the Mac app store and Apple’s growing install base of Mac users I suspect we will see incredibly quick adoption of support for the MacBook Pro’s Retina Display.